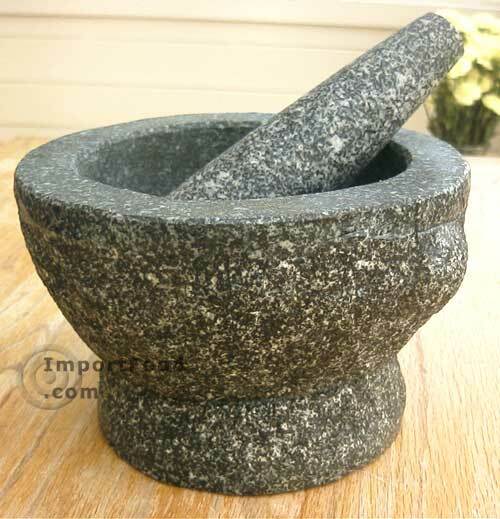 Our solid granite mortar and pestles have been our top seller over the years. We've sold directly to customers like you, and also to large national retail stores. The 6" size is by far the most popular at the retail level. It has a generous bowl, good heavy weight, and it's not so large that it becomes a burden to store in your kitchen. Infuse fresh ground flavors of basil, sage, tarragon, garlic, pepper and much more. The highest quality mortar and pestle you will ever find. What sets it apart from others is the generous capacity, the beautiful appearance, and you can whack it as hard as you can without fear of chip or crack. You'll know when you pick it up that it will last a lifetime--they're very heavy and solid. The mortar is carved by hammer & chisel from a single block of grante. The mortar is 6" across the top, has a 1.5 cup capacity, weighs 7 lbs. 4 1/2" inner bowl, 4" height. 6" pestle.